BELIZE CITY, Mon. Jan. 11, 2016–The US$100 million mega-tourism enterprise which was supposed to include a cruise port and an expansive shopping zone offshore Belize City, could be abandoned after a short meeting between the developer, Michael Feinstein, and Prime Minister Dean Barrow on Friday. Amandala readers will recall that the Feinstein project had gotten rare bipartisan support when a bill to grant exemptions on the payment of taxes and duties was taken to Parliament early 2014. “All the Prime Minister was to do was to sign the statutory instrument and we would be set to go…” Feinstein told us today. “The only way I would revisit [the Stake Bank project], is if Government guarantees the loan,” he said. After the latest revelation that the Government has been entertaining other potential cruise port investors, Feinstein said that he has no guarantee that others won’t be brought in to the sector, which would make it hard for him to secure the returns he needs to have on the investment to make it viable. “The fact that Prime Minister could actually entertain that when I am about to start a project makes it impossible. It makes no business sense to go down that road,” the developer told us. Feinstein said that he requested the meeting with Barrow when he heard rumors floating around about a new cruise port development in the City, reportedly at Port of Belize. 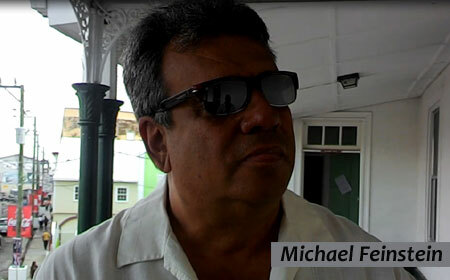 A cruise port at the same location for which ground was broken under the Musa administration, in a partnership between Port of Belize and Carnival Cruise Lines, had been subsequently abandoned. Feinstein said that when he took representatives of Royal Caribbean to see the Southside port, they were concerned about its location, near the city’s sewer system. Feinstein said that Barrow has been in talks with British billionaire Michael Ashcroft about pursuing the development at Port of Belize – which is being held under receivership by an Ashcroft bank, British Caribbean Bank of the Turks and Caicos Islands. He added that Chukka (the tour company out of Jamaica) has a group that is also being entertained, and there is a third company reportedly waiting in the wings. Arturo “Tux” Vasquez, receiver of the Port of Belize, told Amandala today that if such a deal were struck with Port of Belize—a development which he welcomes—the partnership of a cruise line would be needed and the only possible partner operating in Belize is Royal Caribbean. “We do need a docking facility, and I still believe this [Port of Belize] is the best option. We’ve discussed it with Government before, but the only way it would work is as a public-private partnership,” he said. He added that Prime Minister Barrow had alluded to such a partnership in his New Year’s Day speech. Vasquez said that Barrow’s comments indicate that there is some serious interest by the Government. Barrow added that, “The new cruise port will be built by the private sector in some form of partnership with Government…” but did not identify the private sector partners with whom the Government could pursue such an enterprise. Vasquez told Amandala that, “If Belize does not get a [new] facility soon, there will be problems in the industry,” since, he said, Belize cannot continue tendering cruise tourists from ship to shore.